Eye-Fi is the world’s first memory card that is capable of wirelessly uploading images and videos from your camera to your computing devices. An Eye-Fi memory card in your camera can completely transform your photography experience by allowing you to only care about shooting pictures and videos and leaving the hassle of transferring the data from your camera to your laptop completely up to Eye-Fi. Your media files will be automatically and securely uploaded wherever you want them as long as you have access to Wi-Fi. 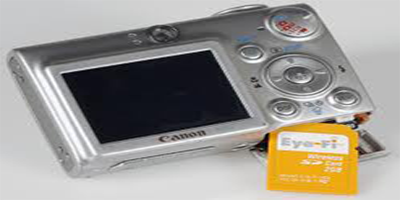 Eye-Fi memory cards store media files the same way any regular SDHC card would with the distinction that the files contained within an Eye-Fi memory card are not subject to a USB cable to get transferred to any of your other devices like laptops or smartphones. These memory cards also have an in-built geotagging feature so that you never have to wonder where you captured your photos again. An ‘Endless Memory’ option can also be configured so that the Eye-Fi memory card automatically erases those media files that have been transferred to another device. This process can take place in the background without interrupting your camera’s performance as long you predetermine the disk space you want to use for this purpose. • Connect X2 – This model comes equipped with a 4GB internal storage. So if you do not wirelessly transfer your files then it can support only up to 4GB of data. • Mobile X2 – This model has similar properties as the one above with the only difference being the memory storage – 8GB. • Pro X2 – This is the most advanced Eye-Fi model which in addition to sporting a 16GB memory storage and the above features, also comes equipped with additional features such as incredibly faster speeds, raw file transfer and auto backup. Because Eye-Fi memory cards can instantly transfer files to other wirelessly connected devices in one command anytime you want, in practical terms they leave your camera with an unlimited storage capacity. Every time you feel like your SD card is brimming with media files, you can simply turn on the Eye-Fi manager in your camera and upload its content to your laptop, tablet or smartphone and completely evacuate your memory. Gone are those days when you had to concern yourself with messy cables every time you wanted to view the pictures shot using your digital camera on your laptop or upload them on Facebook, Instagram and YouTube. Eye-Fi negates the need for USB cables and the tiresome task of manually sifting through files on your SD card in order to add them to your pictures or video library. Eye Fi memory cards can allow users to shoot great looking pictures from their digital cameras and instantly share them online via their smartphones.